Menon, Vikas Shanmuganathan, Balasubramanian Thamizh, Jaiganesh Selvapandian Arun, Anand Babu Kuppili, Pooja Patnaik and Sarkar, Siddharth 2018. Personality traits such as neuroticism and disability predict psychological distress in medically unexplained symptoms: A three-year experience from a single centre. Personality and Mental Health, Vol. 12, Issue. 2, p. 145. Rossen, Camilla Blach Buus, Niels Stenager, Elsebeth and Stenager, Egon 2017. Identity work and illness careers of patients with medically unexplained symptoms. Health: An Interdisciplinary Journal for the Social Study of Health, Illness and Medicine, p. 136345931773944. Morton, LaKrista Elliott, Alison Cleland, Jennifer Deary, Vincent and Burton, Christopher 2017. 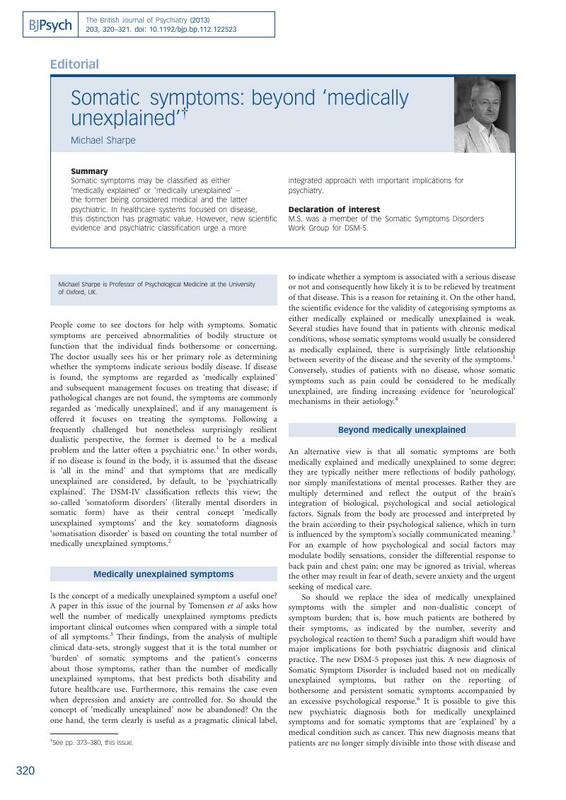 A taxonomy of explanations in a general practitioner clinic for patients with persistent “medically unexplained” physical symptoms. Patient Education and Counseling, Vol. 100, Issue. 2, p. 224. Green, Ryan R. Jacobson, Daniel A. Wesley Waggoner, J. and Armistead-Jehle, Patrick 2017. Handbook of Military Psychology. p. 137. Jank, Robert Liegl, Gregor Böckle, Markus Vockner, Barbara and Pieh, Christoph 2017. Häufigkeit somatoformer Syndrome in der Allgemeinmedizin. Zeitschrift für Psychosomatische Medizin und Psychotherapie, Vol. 63, Issue. 2, p. 202. Bass, C. and Halligan, P. 2016. Functional Neurologic Disorders. Vol. 139, Issue. , p. 509. Tegethoff, Marion Stalujanis, Esther Belardi, Angelo Meinlschmidt, Gunther and Seedat, Soraya 2016. Chronology of Onset of Mental Disorders and Physical Diseases in Mental-Physical Comorbidity - A National Representative Survey of Adolescents. PLOS ONE, Vol. 11, Issue. 10, p. e0165196. Bass, Christopher and Pearce, Steve 2016. Severe and enduring somatoform disorders: recognition and management. BJPsych Advances, Vol. 22, Issue. 2, p. 87. Anbarasan, Deepti Campion, Gabriel Campion, Paul and Howard, Jonathan 2016. Clinical utility of the list sign as a predictor of non-demyelinating disorders in a multiple sclerosis (MS) practice. CNS Spectrums, Vol. 21, Issue. 03, p. 265. Gureje, Oye 2015. Classification of somatic syndromes in ICD-11. Current Opinion in Psychiatry, Vol. 28, Issue. 5, p. 345.
van Geelen, Stefan M. Rydelius, Per-Anders and Hagquist, Curt 2015. Somatic symptoms and psychological concerns in a general adolescent population: Exploring the relevance of DSM-5 somatic symptom disorder. Journal of Psychosomatic Research, Vol. 79, Issue. 4, p. 251. Rosendal, Marianne Carlsen, Anders Helles Rask, Mette Trøllund and Moth, Grete 2015. Symptoms as the main problem in primary care: A cross-sectional study of frequency and characteristics. Scandinavian Journal of Primary Health Care, Vol. 33, Issue. 2, p. 91. Rodríguez-Testal, Juan Francisco Cristina Senín-Calderón and Perona-Garcelán, Salvador 2014. From DSM-IV-TR to DSM-5: Analysis of some changes. International Journal of Clinical and Health Psychology, Vol. 14, Issue. 3, p. 221. Brakoulias, Vlasios 2014. DSM-5 bids farewell to hypochondriasis and welcomes somatic symptom disorder and illness anxiety disorder. Australian & New Zealand Journal of Psychiatry, Vol. 48, Issue. 7, p. 688. Bigler, Erin D. 2014. Effort, symptom validity testing, performance validity testing and traumatic brain injury. Brain Injury, Vol. 28, Issue. 13-14, p. 1623. 1 Sharpe, M., Mayou, R., Walker, J. Bodily symptoms: new approaches to classification. J Psychosom Res 2006; 60: 353–6. 2 Mayou, R., Kirmayer, LJ, Simon, G., Kroenke, K., Sharpe, M. Somatoform disorders: time for a new approach in DSM-V. Am J Psychiatry 2005; 162: 847–55. 3 Tomenson, B., Essan, C., Jacobi, F., Ladwig, KH, Leiknes, KA, Lieb, R., et al Total somatic symptom score as a predictor of health outcome in somatic symptom disorders. Br J Psychiatry 2013; 203: 373–80. 4 Woolf, CJ. Central sensitization: implications for the diagnosis and treatment of pain. Pain 2011; 152 (suppl 3): s2–15. 5 Tracey, I. Imaging pain. Br J Anaesth 2008; 101: 32–9. 6 American Psychiatric Association. Diagnostic and Statistical Manual of Mental Disorders (5th edn) (DSM-5). APA, 2013. 7 White, PD, Goldsmith, KA, Johnson, AL, Potts, L., Walwyn, R., DeCesare, JC, et al Comparison of adaptive pacing therapy, cognitive behaviour therapy, graded exercise therapy, and specialist medical care for chronic fatigue syndrome (PACE): a randomised trial. Lancet 2011; 377: 823–36. 8 Van Kessel, K., Moss-Morris, R., Willoughby, E., Chalder, T., Johnson, MH, Robinson, E. A randomized controlled trial of cognitive behavior therapy for multiple sclerosis fatigue. Psychosom Med 2008; 7: 205–13. 9 DeGucht, V., Fischler, B. Somatization: a critical review of conceptual and methodological issues. Psychosom 2002; 43: 1–9.